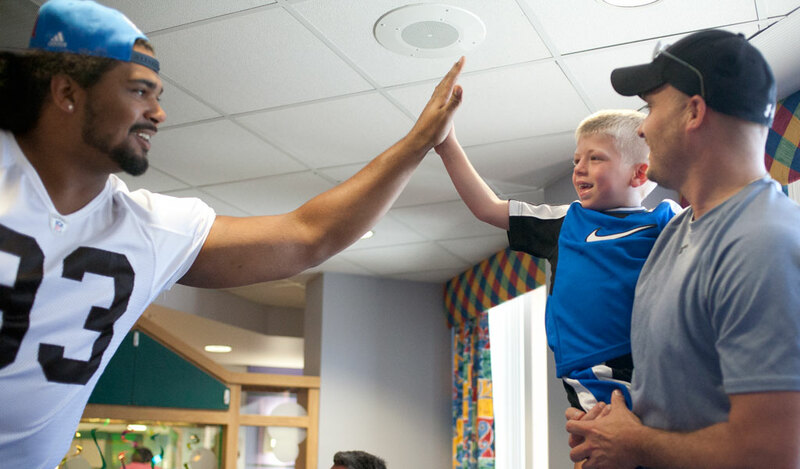 “Oh my” was the quote of the day as patients welcomed three very tall and very large Cleveland Browns players into their rooms at Akron Children’s Hospital on June 19. The players – defensive tackles John Hughes and Billy Winn as well as linebacker Craig Robertson – are new to the 2012 Cleveland Browns roster. Patients, staff and hospital visitors in Akron Children’s Showers Family Center for Childhood Cancer and Blood Disorders were full of smiles and laughs during the young players’ stay. There was even some Madden NFL playing. The surprise visit was thanks to collaboration among Phil Lopez, event chair for the LoPen Charity Golf Outing, Jeffery Hord, MD, medical director of the Showers Family Center, and Lopez’s friend Vince Calo, president and General Counsel of Blaster Sports & Media and NFL agent to Hughes. The Showers center is one of the largest in northern Ohio that takes care of children and teens with cancer and blood disorders. The events have raised more than $300,000 for the hospital, and funds are used to provide support to the area of greatest need. This has included expanding the stem cell transplant program and assisting families with financial hardships. Even Pittsburgh Steelers’ fans welcomed and enjoyed the players’ visit as they all happily posed for photos and laughed about the rivalry.